Astrophotographer Marisha Sharma of New Delhi, India, captured this photograph of a penumbral lunar eclipse on April 25, 2013. The full moon will dip into Earth's shadow tonight (Oct. 18), producing a lunar eclipse that can be seen by keen observers around the world. Weather permitting, skywatchers in Africa, Europe, western Asia, and the eastern parts of North and South America will get the chance to observe part of the southern portion of the moon passing into Earth's penumbra — the planet's outer shadow. This diagram shows how the moon will pass through the Earth's penumbra (shadow) on Oct. 18, 2013. You can also watch the eclipse online. The online Slooh Space Camera will air a live broadcast of the eclipse starting at 2:45 p.m. EDT (1845 GMT). Slooh's team of experts will join the show at 7:30 p.m. EDT (2330 GMT) to comment during the eclipse's peak. 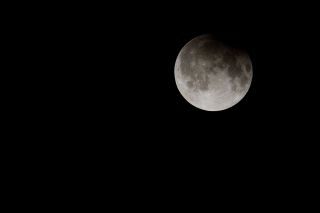 You can watch the penumbral eclipse webcast live on SPACE.com, courtesy of Slooh. "Although a penumbral lunar eclipse might go unnoticed by someone casually glancing at the moon, we will be able to observe the gradual shading of the moon in the live images Slooh will broadcast throughout the eclipse," Slooh's Paul Cox said in a statement. "The shading becomes far more apparent when viewed as a time-lapse, and we’ll show viewers that during the live segment of the show." People in the western portion of the United States probably won't get a very good eclipse show. The deepest phase happens during the late afternoon hours before moonrise, but people on the east coast are in a better position to see this celestial event because it occurs right after sunset. The penumbra may be seen over the southern limb of the moon. Skwatchers in Africa, Europe and western Asia will be able to catch the eclipse during the middle of the night, as the moon is high in the night sky. The shading will look like a slightly reddish tint on the bright full moon, according to SPACE.com skywatching columnist Joe Rao. This diagram shows where people will be able to see moon will pass through the Earth's penumbra (shadow) on Oct. 18, 2013. A penumbral eclipse is not necessarily as striking as a total or partial eclipse. During a partial eclipse, the inner shadow (called the umbral shadow) of the Earth partially blocks the moon, while a total eclipse occurs when the Earth's umbra completely casts the moon in shadow. Editor's Note: If you snap an amazing picture Friday's penumbral lunar eclipse or any other night sky view that you'd like to share for a possible story or image gallery, send photos, comments and your name and location to managing editor Tariq Malik at spacephotos@space.com.